I did not expect to love this quilt as much as I do. 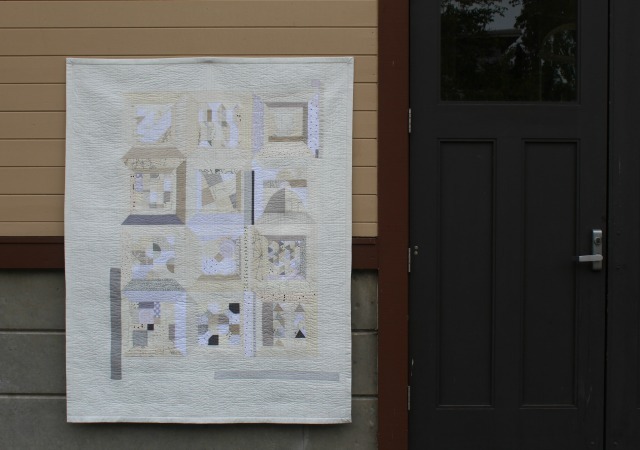 Back last September when Caitlin/Salty Oat announced the Modern Sampler quilt along, I was awed by Yoshiko Jinzenji's quilt and pretty much jumped in not really knowing what I was getting into. But from day one, I planned on working in a very neutral palette, which was part of the challenge, and something that drew me to it. Through the months I somewhat regretted my choice to go completely neutral, as I saw the work of others, and I loved what they were doing with small bits of color. But I stuck with my plan, even though late one night towards the end of making blocks, I was over-zealous sewing from my scrap basket, and some dark gray snuck in. Rather than take it out when I realized what I'd done, I let fate have its way and embraced it going forward. 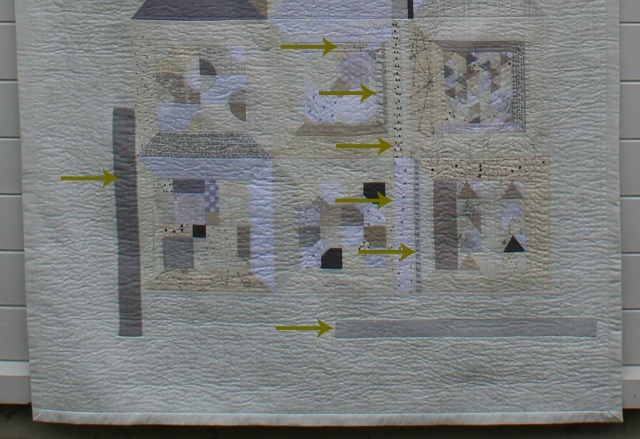 If I'd paid more attention at the out-start, I would have realized that templates would play a key role in the making of this quilt. I would have noticed that every block had one, if not two mitered borders. If I had even read through the pattern booklet, I would have definitely detected that elements of applique (made with templates) were called for once the borders were on. Seriously, any one of those things probably would have turned me off right then and there. I'm so glad I wasn't paying attention. Truth be told, on every block, if there was a way to construct without a template, I did. For a few blocks, I created my own paper-piecing templates, and for some I just measured and cut. Let's just say, some of these blocks had alot of little pieces! But mitered corners became second nature in no time. Once the blocks were done, I kind of broke QAL rules and went full speed ahead. I think I could see the end in sight and just went for it. Borders, something I very rarely incorporate into my quilts these days, seemed important with this one, and while I was struggling with what to choose, I stumbled across Modern Background - Paper from Zen Chic at my local shop, bought the rest of the bolt, and from the moment I held it up to my quilt, I was certain I'd made the right choice for me. I was warmed up from doing applique during this month's Mighty Lucky challenge, so doing what needed done to finish this quilt top was more pleasure than drudgery. There were 12 pieces to be added, in a variety of shapes and sizes ranging from 1/2" x 1 1/2" to 2" x 20". As with the blocks, I either traced the needed shape from the pattern, or used good old ruler and rotary to cut what I needed. I've tried to show you in the two photos below where those applique pieces are, as it's not always necessarily noticeable. For backing, I continued with the neutrals, piecing together large swaths of the Zen Chic and Latifah Saafir's Grafic Chain Link Fence in Birch, with an unknown stripe. I'm so glad I kept the back as quiet as the front. 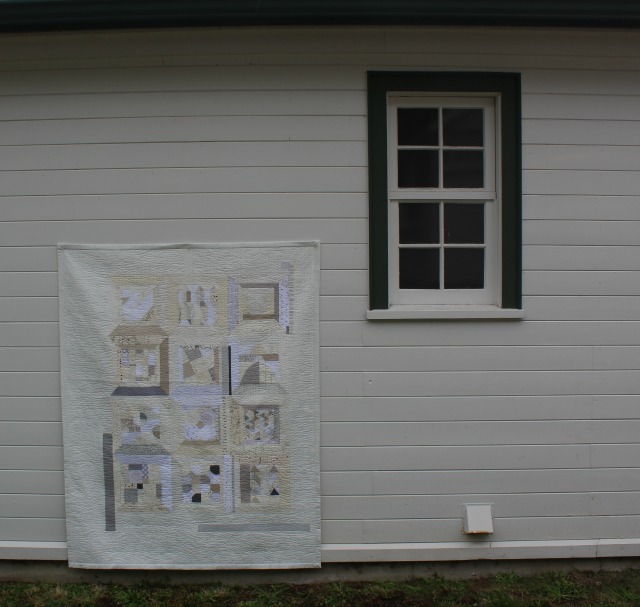 When it came time to quilt, I thought the simpler the better. With so much detail in the blocks, I felt straight-line would do them justice without overwhelming, and I quilted every 1/2". I did choose to add interest by using three much-loved neutral threads: Aurifil 50wt #2021 (natural white), #2310 (light beige), and #2600 (light gray). There's no doubt in my mind they made this quilt better. The subtle tones somehow became even subtler yet, and the resultant texture downright alluring. It finally came time for a binding choice. Thankfully I had just enough of that Zen Chic left to do a chunky 1" binding, the same width as those smaller mitered borders on many of the blocks. Something about it just sets it all off for me. Finishing at 51" x 65", this quilt was truly serendipity at its finest. So much about it would not have been my choice to event attempt, but I'm convinced it was important for me to do. 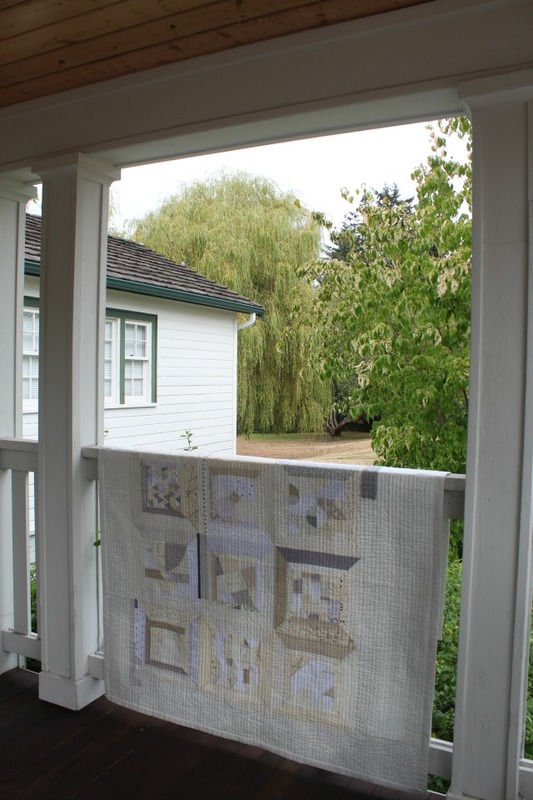 This quilt is from my Q3 Finish-A-Long list! All photos were taken at Heritage Park, Lynnwood WA. Linking up with Finish It Up Friday and 2016 FAL Q3 Finishes Link-Up. I'm always amazed at what you create. 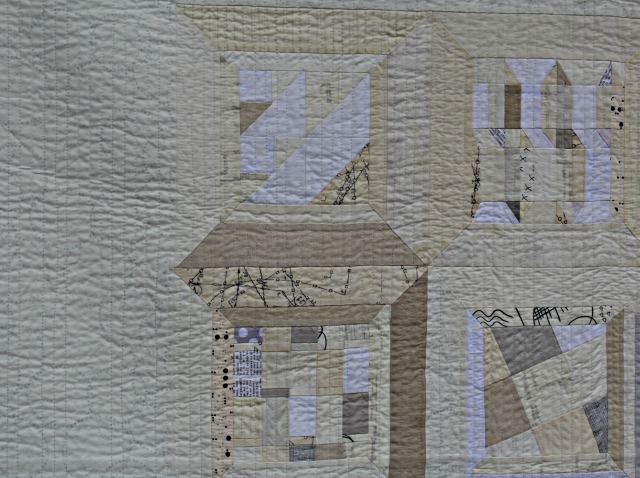 I love the colorway and designs that you put together and yes the quilting really sets it off! This is one of my favorites this year! Watching your progress and seeing the finish has been a pleasure! 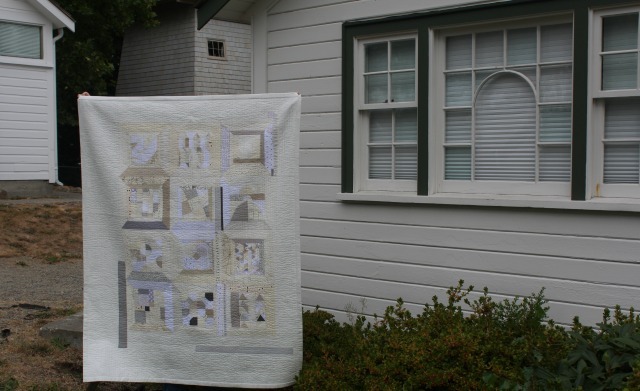 I am inspired to try a neutral only quilt...hopefully soon and hopefully color won't find its way in as it usually does! This quilt is gorgeous. 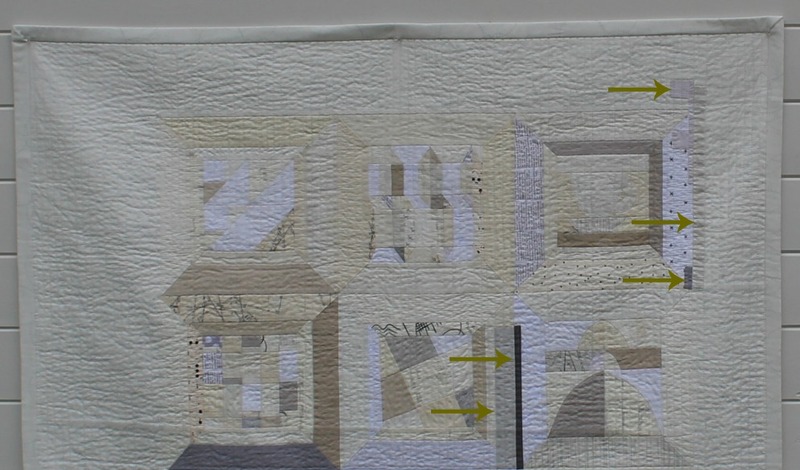 The straight line quilting is perfect for the quilt. I suppose I will also go for that. But it will take some time until I am so far. It's been such fun watching this quilt come to life. It is absolutely stunning. Congrats on such a terrific finish. This is so pretty. I've always wanted to do an all low volume quilt. I think the quilting you chose is perfect. I have been watching this move along and it is really a lovely whisper. One of those quiet voices that makes a big sound! A true masterpiece! Really, really love it!! ooohhhh I LUV LUV LUV IT! so many great choices and the end result is so special! I absolutely LOVE this one! It's beautiful!!! I love it so much!!! So beautiful!!! Dear Debbie - I must admit that I was a little doubtful when you started on these "pale" blocks and now that I see the final result I am completely smitten. What a precious beauty! Your have really done a perfect job! And now I will go all the way back and read through your posts about this quilt - it is so interesting! It is quite effective. Wonder why the appliqué pieces weren't just pieced as they are all straight, though.. I really love how this quilt came together, Debbie. It might seem quiet from a distance, but it begs for a much closer look. And the backstory about the process just adds to it for me. 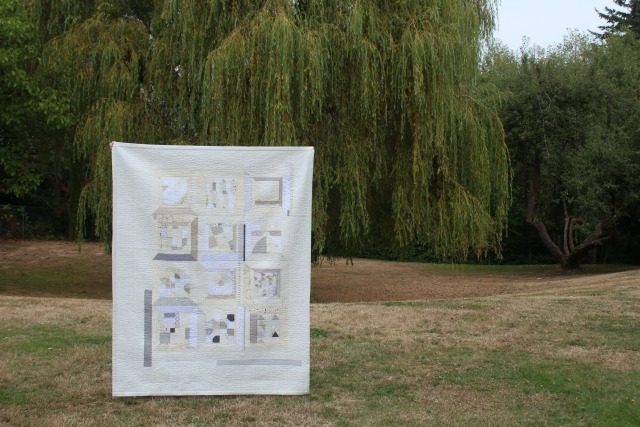 I love that you jumped in with both feet... and made it work and created this stunning quilt in the process. It is a beautiful quilt Debbie. I like your fabric choices which tone so well together, it's the kind of quilt which will endure, rather than one you love now and go off later. It gets my vote. I love this quilt! As I watched block by block I was honestly feeling rather iffy, yet the whole is definitely greater than the sum of the parts. The quilting and binding were the perfect choices. Congrats on trying and finishing something outside your comfort zone! Totally my kind of colors. I am intrigued by the texture in this quilt. Straight line quilting yet that wrinkly texture. Interesting and cool. I love this! If I saw the amount of work involved, I would have run the other way as well. Great finish.... I'd never let this leave my family room. It should be enjoyed every day! I love the colour of the border especially that it is a bit different from the blocks but still so very right. Well done on the whole. It really is stunning! I love that there was so much about it that you wouldn't have attempted, but that you went through with it (or some version of it) and the end result is so wonderful. I love the subtle beauty of this quilt. Something like this has been on my want to make list ever since you started. I love your quilt! I started the QAL, but had to set it aside mid-way. Three more projects to finish, and I can revisit it! 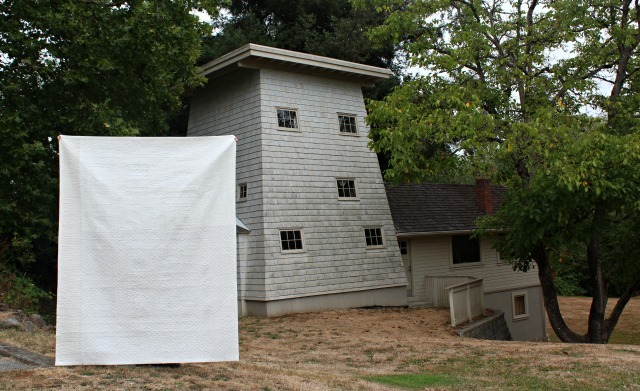 Your quilt inspires me to check it off the UFO list.